1 23rd Jan 19:37 ILB Report of flares and missing boat, River Tamar. Stood Down before launch. 2 23rd Feb 12:31 ILB Reports of a dinghy seen adrift in Wembury Bay. No one on board, towed to River Yealm. 5 1st Mar 14:08 ALB University dive boat trapped under the Breakwater Fort pier. Towed to Queen Anne's Battery. 8 16th Mar 13:41 ILB Reports of a possible capsized dinghy with people in the water near the MOD fueling jetty on the River Tamar. Nothing Found. 11 22nd Mar 20:24 ILB Missing female in the Devils Point area. After a search she was located near the shoreline by a shore team. 12 22nd Mar 20:24 ALB Missing female in the Devils Point area. After a search she was located near the shoreline by a shore team. 13 30th Mar 18:27 ALB Stood by the 82m cargo vessel 'Taigeta', until a Coastguard tug 'Anglian Earl' arrived on scene from Falmouth. 14 5th Apr 17:32 ILB Report of persons in difficulties in an inflatable dinghy off Tinside Lido. They were safely ashore before the ILB arrived on scene. 15 7th Apr 23:39 ILB Report of a person missing from a yacht on the River Tamar. Stood down before launch as person was found safe ashore. 16 7th Apr 23:39 ALB Report of a person missing from a yacht on the River Tamar. Stood down before launch as person was found safe ashore. 17 10th Apr 15:52 ILB Broken down speed boat on the River Plym. Towed to safety. 18 10th Apr 18:47 ILB Small yacht aground near Jupiter Point. Once the crews safety was assured and an anchor laid, the ILB returned to station. 20 16th Apr 00:25 ALB Yacht aground at Dandy Hole, on the River Lynher. Y-Class went up the river due to the low tide and evacuated two crew from the yacht to the Lifeboat. The crew were then taken to Plymouth Yacht Haven. The yacht re-floated itself in the early hours on the incoming tide. 22 27th Apr 18:24 ILB Launched to two women cut off by the tide at the entrance to the River Erme. 23 27th Apr 18:24 ALB Launched to two women cut off by the tide at the entrance to the River Erme. 24 27th Apr 18:40 ALB Re-tasked from the above incident to conduct a shoreline search in Jennycliff Bay for a missing person. He was found by the Police. 26 13th May 15:39 ILB Tasked to a small powerboat who had run out of fuel at Cargreen on the River Tamar. Vessel was towed to its berth. 27 22nd May 12:40 ILB Small sailing yacht with engine failure drifting very close to the rocks off Devils Point. ILB towed the yacht to her mooring in Stonehouse Creek. 29 23rd May 12:18 ILB Sailing yacht with a female with head injuries on board. Evacuated to the lifeboat station where she was met by Plymouth Coastguard and an Ambulance. 30 23rd May 13:30 ILB Tasked to a powerboat 1 mile south of the breakwater taking on water through her starboard exhuast pipe. ALB also tasked. 32 23rd May 14:30 ILB Small motor boat in Cawsand Bay with engine failure. Towed to Hooe Lake. 33 23rd May 19:26 ILB Launched to a report of a windsurfer in difficulties on the River Lynher. The area was searched with R193 and the Tamar Coastguard Team. 34 23rd May 19:36 ALB Y-Class launched to assist in the search for the windsurfer, ALB remained at the entrance to the Lynher due to the low tide. 35 24th May 18:54 ILB Tasked to a small powerboat which had been on fire off Devils Point. Towed to Yacht Haven Quay and met by Plymouth Coastguard. 37 30th May 12:30 ALB Casualties taken on board and taken ashore, returned to the scene and launched Y-Class to see if the powerboat could be towed off, however the tide was too low. 38 5th June 11:10 ILB Tasked to reports of an inflatable dinghy adrift near the Rusty Anchor, no persons found to be in danger. 39 6th June 12:30 ILB Whilst afloat for the start of the Round Britain and Ireland Race the ILB was tasked to a small broken down boat, towed to Stonehouse Creek. 40 6th June 19:26 ILB Tasked to search the shoreline around the Tamar Bridge on the Plymouth side for a missing 18 year old female. She was located by police at around 21:30. 41 6th June 19:35 ALB Tasked to search the shoreline around the Tamar Bridge on the Plymouth side for a missing 18 year old female. Y-Class also launched due to the low tide. 42 10th June 16:30 ILB Launched to a report of persons in an inflatable dinghy in difficulties off Tinside. Nothing found. 43 11th June 12:43 ALB Princess 78 on trials, with a fuel supply issue, near Drakes Island when she put out a distress call. ALB Stood by until another Princess boat arrived on scene. 44 14th June 17:45 ILB 40ft yacht in Dandy Hole, River Lyhner, who had run aground and wrapped her anchor chain around her keel. 46 17th June 19:57 ILB Report of a missing male in Whitsand Bay after a bag and mobile phone were found. The man was found safe and well, on his way home; having forgotten his bag. 47 17th June 19:57 ALB Report of a missing male in Whitsand Bay after a bag and mobile phone were found. The man was found safe and well, on his way home; having forgotten his bag. 48 17th June 21:00 ALB While returning to station from the previous incident the ALB was tasked to a 20ft powerboat which was broken down off the Great Mewstone. 49 20th June 00:00 ALB Vessel aground, STOOD DOWN before launch. 50 20th June 14:55 ILB 50ft powerboat with engine room fire, 3 miles south of Yealm Head. No fire on arrival, two persons who had been in a liferaft were transfered from the ILB to the ALB. 52 26th June 15:51 ILB Tasked to assist ambulance service and Plymouth Coastguard in evacuating a male from the front of The Hoe who had collapsed. 53 26th June 16:30 ILB 25ft motor vessel with no electrical power drifting in Cawsand Bay, towed to Plymouth Yacht Haven. 54 26th June 20:05 ILB 22ft yacht aground on Plymouth Hoe foreshore, unable to refloat until the next high tide, so vessel made secure. 57 1st July 18:27 ALB Launched to a yacht which had been in collision with Laira Bridge, she was towed to Yacht Haven. 59 3rd July 16:25 ILB STOOD DOWN from a report of persons in the water off The Hoe, they were found to be safe ashore. 60 3rd July 20:58 ILB Report of two children struggling in the water off Mountwise, both children had made it safely ashore by the time the ILB arrived on scene. 62 4th July 08:27 ALB Male requiring a medical evacuation from a yacht anchored in the River Lyhner. ALB transferred the casualty back to the Lifeboat Station. 63 5th July 08:34 ALB Man with a possible heart attack on a fishing boat in Wembury Bay, transfered to ALB where he was then lifted by a helicopter (R193). 67 11th July 15:47 ALB Report of a vessel aground on Plymouth breakwater. 68 11th July 20:32 ILB Person stranded after attempting to retrieve their dog. 69 14th July 08:53 ILB Small broken down boat with electrical failure towed to its moorings. 70 14th July 19:00 ILB Windsurfer in difficulties infront of The Hoe, he was landed ashore. 71 15th July 08:15 ALB Search for an overdue yacht between the Yealm and Burgh Island, after a two hour search the yacht was found safe in the River Yealm. Salcombe Lifeboat also tasked. 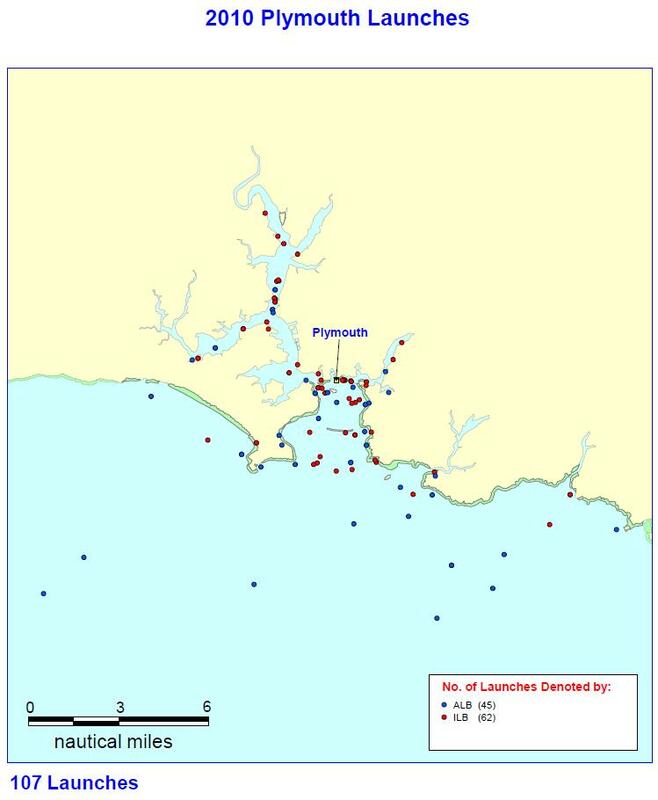 72 15th July 08:26 ILB Launched to evacuate a person from a yacht on the River Tamar, due to poor weather conditions. 73 15th July 09:15 ILB Re-tasked after the first incident to a broken down boat at Cargreen, which was towed to Saltash. 76 26th July 18:58 ILB Two persons reported in the water at Saltash, the ILB was stood down whilst enroute as the persons were safe ashore. 77 27th July 14:47 ALB Tow of a broken down fishing vessel 6 miles SW of Rame Head. 78 1st Aug 10:50 ILB Tasked to a broken down dive RIB drifting in Wembury Bay, they were towed back to Plymouth. 79 1st Aug 16:05 ILB Tasked to a broken down powerboat in Plymouth Sound. Towed to the River Plym. 80 5th Aug 22:00 ILB Report of a light flashing on the rocks at the entrance to the R Yealm. Investigated, person found to be safe and well. False alarm with good intent. 81 11th Aug 16:31 ALB Pan Pan message recieved by the CG from a boat on the Tamar River. MOD dealt with the vessel as he was only broken down, so ALB stood down enroute. 83 19th Aug 00:45 ALB Fishing vessel Lone Wolf with engine failure drifting 4 miles South of Plymouth, towed to Sutton Harbour. 85 23rd Aug 09:07 ILB Launched to a broken down boat which was drifting near Mountbatten. 86 24th Aug 15:08 ILB Report of two teenagers in the water on the River Plym, both had made it ashore upon the arrival of the ILB. 87 24th Aug 20:55 ILB Report of a red flare in the Tavy Bridge area. Area searched along with Plymouth Coastguard, nothing found. 89 27th Aug 18:53 ILB Launched to a broken down powerboat off Plymouth Breakwater, the vessel was towed to Stonehouse Creek. 90 4th Sept 17:16 ALB Capsized powerboat in Whitsand Bay, assisted by RNLI Lifeguards and Tamar Coastguard Team; vessel was re-floated and towed back to Plymouth. 91 8th Sept 14:38 ALB Launched to a 17m vessel with mechanical failure around 7 miles south of Rame Head. Towed to Plymouth. 94 14th Sept 17:16 ALB Male with intentions to jump from the Tamar Bridge, Police on scene, Lifeboat stood down before launch. 95 14th Sept 21:34 ILB Female, threatening to jump from the Tamar Bridge. Detained by police, ILB stood down after launch. 96 17th Sept 22:58 ILB Broken down powerboat drifting in the dark between the Breakwater and Kingsand. Vessel towed to Plymouth Yacht Haven. 97 20th Sept 11:45 ALB Launched to an angling boat E. L. B. off Penlee Point who had a heart attack victim on board. Casualty transfered to the Lifeboat and taken ashore. 98 21st Sept 19:19 ILB Male threatening to commit suicide by jumping from the Tamar Bridge. After a search with Plymouth Coastguard and Police he was found safe ashore. 99 21st Sept 19:19 ALB Male threatening to commit suicide by jumping from the Tamar Bridge. After a search with Plymouth Coastguard and Police he was found safe ashore. 100 28th Sept 19:11 ILB Search for a missing person in the Plymouth Sound area, nothing found. 101 1st Oct 09:37 ALB Search for a missing person in the Mutton Cove area, a male was detained by Police. 102 4th Oct 02:44 ALB Report of a female entering the water at Devils Point. Lifeboat stood down before launch as casualty had been recovered. 104 4th Oct 21:15 ILB Yacht aground in the Cattewater, situation resolved, so lifeboat stood down before launch. 105 5th Oct 23:25 ILB Reports of a person attempting to jump from the Tamar Bridge. Male was found safe at home. 106 5th Oct 23:25 ALB Reports of a person attempting to jump from the Tamar Bridge. Male was found safe at home. 107 18th Oct 19:10 ILB Report of an upturned dinghy at Hooe Lake, no persons were on board. 108 19th Oct 13:18 ILB Broken down dive RIB in Whitsand Bay, divers recovered from the water and the vessel towed ashore. 111 4th Nov 16:08 ILB Launched to a missing person in Jenny Cliff Bay. The person was found safe before arrival of the Inshore Lifeboat. 112 12th Nov 16:56 ALB Report of a missing surfer in Whitsand Bay, the lifeboat was stood down enroute as the situation had been resolved. Looe Inshore lifeboat also tasked. 113 13th Nov 11:40 ALB Report of cries for help near Rame Head. Tamar Coastguard found a person with a suspected broken leg on the cliff path. The lifeboat was then stood down. 114 16th Nov 19:02 ILB Paddle border struggling against the tide in gale force winds and the dark, north of the Tamar Bridge. After a search he was passed to an ambulance by the MOD Police. 115 18th Nov 18:10 ALB Search for a missing person in Hooe Lake. The Y-Class conducted a search with Plymouth and Yealm Coastguard Teams. Nothing found. 116 19th Nov 22:28 ILB Search in Jenny Cliff Bay and the Sound , with Plymouth Coastguard and MOD Police; after several red flare reports. Nothing found. 117 19th Nov 22:55 ALB Search in Jenny Cliff Bay and the Sound , with Plymouth Coastguard and MOD Police; after several red flare reports. Nothing found. 118 7th Dec 10:30 ALB Report of a refuse lorry in danger of falling over a cliff in Heybrook Bay with persons trapped inside. Persons escaped unhurt so Lifeboat was stood down. 119 26th Dec 11:53 ALB Injured dog stuck down a cliff near the River Yealm.